There's still time to participate in Color Challenge 50! Remember, you don't have to have the EXACT colors to play. Just use colors inspired by the ones you see below. Nicole Vögeli saw a lovely wintry scene in Color Challenge 50! I love how she made the kitty the gray of the combo surrounded by Snowflake Flurry snowflakes swirling amidst the blues and greens. So pretty and different. And check out this floral fantasy by Carol Hintermeier. 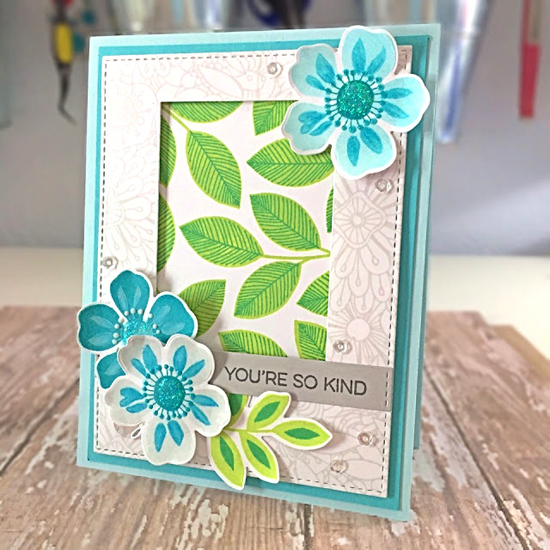 She features the Flashy Florals stamp set and Die-namics coloring up the pretty flowers and leaves to match Color Challenge 50. This card does double duty as an entry for Sketch 291! Really need that kitty stamp now! Love the flowers in blue; I'll have to try with mine!